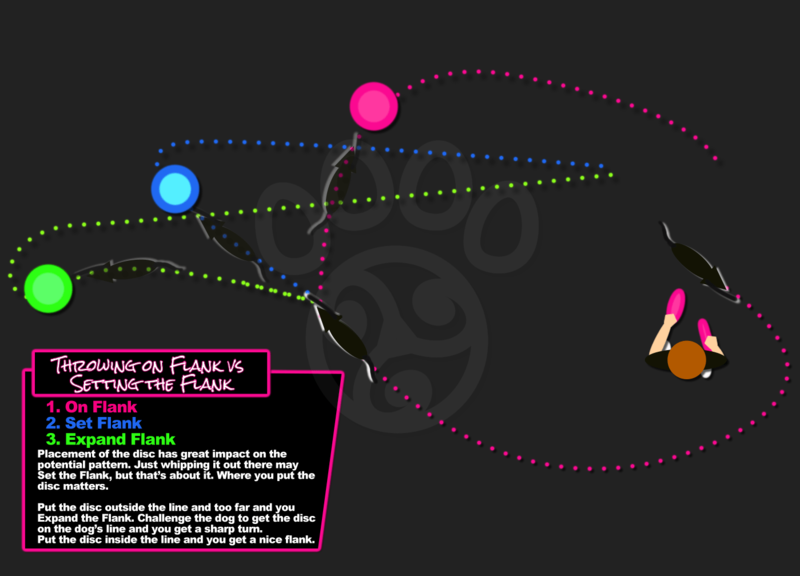 An illustrated look on the effects of reward placement on the shapes and lines that a disc dog runs during a round of disc dog freestyle. Setting the FlankSetting the Flank means to throw out to your right or left. It’s really simple, just face any direction, send the dog Around, and then turn and throw the disc out to the side. It is important to face forward first, as the Flank is out at 9 or 3 o’clock, and you want to condition the dog to be... is a key aspect of disc dog flatwork as taught by Pawsitive Vybe. It’s all about getting the dog out to the side to create space, time, and unique angles to work with your dog in order to display various shapes and Team MovementTeam Movement is how dog and handler move, as a team, out there on the field. It is a judging category in some organizations and certainly is a focus of many judges, players, and fans, when assessing the performance of a freestyle routine. Is movement synchronized? Is it cooperative?Do dog and handler move well together? Are they moving together at.... That said, there is more to Setting the FlankOut to the side of the handler is the Flank. If the dog is out to the handler's right or left the dog is on Flank. If the dog is moving with the handler the dog is on the Working Flank.... than just driving the dog out to the side. The dog puts his face where the disc happens. The patterns your dog runs is based upon where, and how you throw it, and little with your dog’s natural tendencies for movement. Natural tendencies of the dog change small things like the direction of the release after catch and the intensity of that release. Speed, distance, angle, and loft / float / hover of the disc are all pattern shaping mechanics. ShapingShaping is a learning technique where successive approximation and a Positive Marker are used to teach behaviors and communicate concepts. Successive approximation essentially means continually closer to the target behavior. So Shaping is a learning technique where you continually get closer and closer to the target behavior using a Positive Marker to tell the dog when she is right. It... a zig zag is usually done through simple reward placement. Throw it over there and then throw it over there, back and forth, and the dog will do a zig zag. If you want to shape that zig zag it is necessary to adjust the speed, distance, angle, and left of discs. If you only throw out front and behind the handler, and throw far, you can only go out and back with straight lines. When a dog runs, it can be envisioned or analogized as a line. This line, like the approach, is shaped and altered by disc placement; the dog puts his face where the disc happens. In the image above the lines are clearly visible. It is assumed that we are on the Strong FlankThe Strong Flank is the flank that the dog wants to run. Most dogs are unbalanced and prefer to move in either a clockwise or counter clockwise fashion. The Strong Flank can also be read and understood as the dog's Strong Lead.... with the dog, meaning that the dog wants to run in that direction. Put the disc on the line and the dog will stay on the line; Setting the Flank. Put it outside the line and the dog will arc out, or Expand the Flank. If you want the dog to hold, work, or continue the Flank, the disc needs to be put inside the line. While playing, discs should be placed thoughtfully to shape and create these lines. Simply throwing the disc away from you, out in front demonstrates no shape, shows a lack of intent, and will lead to a linear, out and back pattern. An out and back game leaves the handler at the mercy of the approaching dog; there is no leverage to be had, about the only thing you can to Team Movement wise is to run forward and meet the dog. By creating and shaping lines with thoughtful and competent disc placement allows the handler to leverage lines to create interesting and useful shapes. Throwing with these ideas in mind is not easy. There is a reason not many players are doing it. People tend to believe that their dogs “won’t” do it, or do not like to do it. This is not true. Running a line is fun and successful technique for all dogs and teams, but the handler has to know a few things and execute the delivery. This means that the Team need to learn the skill, and that means more than giving it a few tries. As a judge or a critic of play, this aspect of the game should be given a look and should get the attention and value it deserves. Unfortunately, at this time, it doesn’t; at all. This aspect of the game is not on many people’s radar. The general trend in disc dog freestyle is to create new and improved tricks and take them to ever increasing heights. It’s awesome, but it is not the only, or even the first place we should be looking for improved in play. Our game is not filled in and fleshed out; there are only a handful of players exploring and exercising these aspects of the game. A zig zag, 2 passes, 2 overs, 2 vaults, and a dog catch are not the whole game of dog frisbee. Neither is catching all your discs, big leaping, or doing the amazing trick. The tricks and catches are important, obviously, but the way we move together, as a Team, the way we throw as a handler, and the way the dog moves as a catcher are, perhaps, the area of the game where we get the most separation in skills on a team by team basis. And it is not even on anyone’s radar. Skipping this part of the game in pursuit of new fancy tricks and throws is like putting sprinkles on some vanilla ice cream and calling it an ice cream sundae. It’s not, it’s vanilla ice cream with sprinkles on it. Where is the fudge? Got nuts? How about some whipped cream? Fill in and flesh out your game with thoughtful disc placement. Create beautiful lines with your dog. Learn to use these skills to not only make your play more aesthetically pleasing, but to demonstrate core competency in throwing, routine building and handling. Use these skills to manage and harness your dog’s drive and to create a stronger connection and team.